A successful Real Estate Career is a series of layers that have to be constructed one layer at the time; it is impossible to become a top Listing agent with 20 or more revolving listings from the first day you get licensed. The first period of your career will be focused on getting lots of answers to questions that deal with Real Estate Marketing, Transaction Management, proper lead management, and building the fundamentals of your business routine. You will then know you have achieved enough complexity and Success when you are mostly done with an obsession to finding answers, and move on to the stage in which you are asking questions to advance your career. 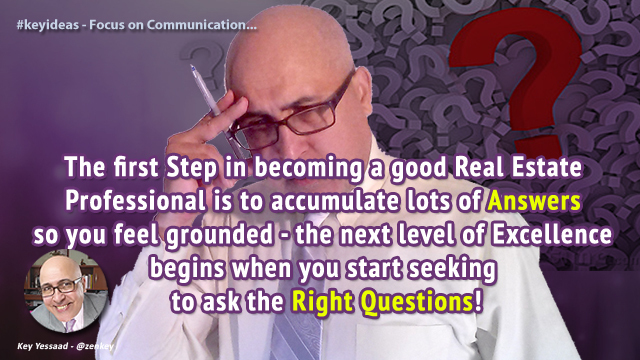 The skill of Asking the Right Questions from the right clients and colleagues is the next layer of mastery in Real Estate.